Mechanical engineers at the University of Southampton are improving predictive models for bone fracture risk by tapping into imaging techniques that can analyse impacts at more than a million frames per second. Researchers in the Materials and Surface Engineering and Biomedical Engineering groups will use the advances to form computer simulations that tackle a number of bioengineering problems, such as predicting injuries in car accidents, understanding hip fractures in falls by the elderly and designing improved body armour in the military. 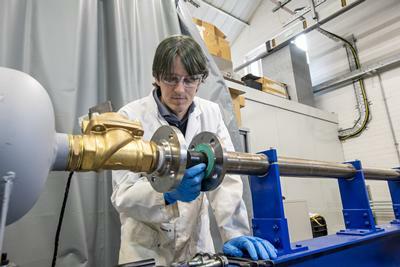 Dr Lloyd Fletcher is spearheading the three-year programme in a new fellowship from the Leverhulme Trust as he extends methods devised from recent research projects on the mechanical properties of bone and impact testing using ultra-high speed imaging. The early career fellowship is developing new test methods that will initially be used on small samples of bone. Data collected from these samples will then be used to develop a numerical model for predicting the breaks in bones. Building on these advances, the research will use its model in computer simulations of whole bone structures such as a skull or femur. Impact experiments will then be conducted on whole bones and the imaging data compared to the computer simulation predictions. The research is utilising facilities from the University’s Testing and Structures Research Laboratory and the Applied Biomechanics Laboratory, which include a Shimadzu HPV-X camera capable of imaging at to five million frames per second with sufficient image quality for deformation measurement. Lloyd is working alongside Dr Frances Davis, who is understanding the properties of soft tissue and tendon under impact loading, and Professor Fabrice Pierron, whose Surgery enabled by ultrasonics Programme Grant is developing the next generation of ultrasonic surgical cutting tools. Models created within the Leverhulme Trust fellowship will help inform how these ultrasonic tools will respond when used to cut bone.